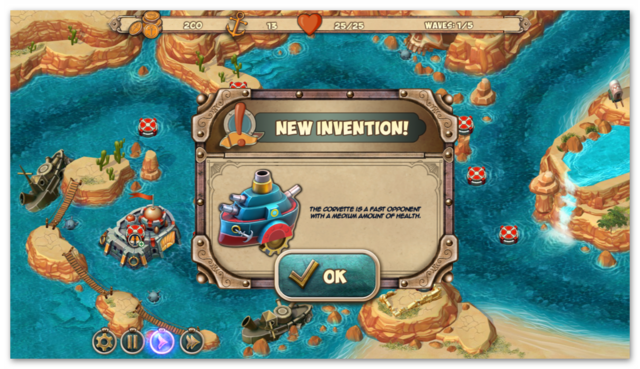 Iron Sea Frontier Defenders was available as a giveaway on April 14, 2019! How would you improve Iron Sea Frontier Defenders? Iron Sea Frontier Defenders downloads to a 75.6MB zip file that unzips to three files, (a setup.gcd security wrapper the set-up file and a read me). The game installs to the following path by default, but can be changed if you wish. The installed game is approximately 83 MB in size. There are two campaigns The West Coast and Lost Land campaigns. The latter requires 35 stars to unlock. 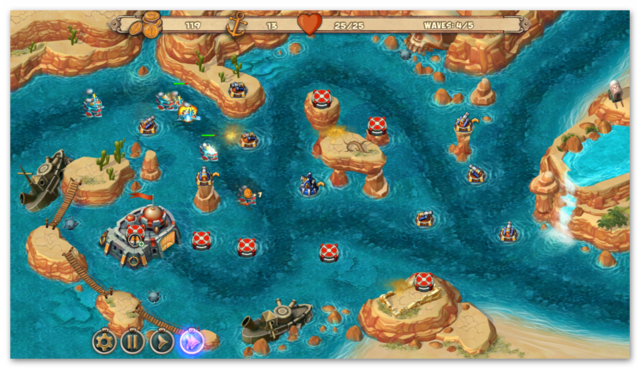 Each campaign comprises of 20 levels which can be played on three different difficulty modes easy, normal and hard. When starting a new game you can skip the tutorial level if you wish. Along the top of the level screen you can see the amount of gold you have; this is used to buy your towers and in game upgrades. Next to the gold indicator are the number of anchors, which are used to buy special upgrades for your towers to have more damage, more range and cost less to purchase other items. You can also spend your anchors on common upgrades such as increasing the amount of money you start a level with, effectively giving you the ability to buy more towers, or you can spend your anchors on increasing the amount of loot you get from destroying ships or increasing the forts strength, so that more enemy ships are required to attack it. Each of these upgrades can be repeated six times, with increasing costs for each extra upgrade. 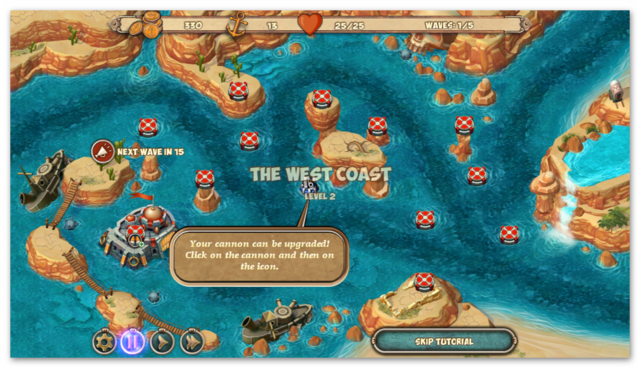 Anchors are awarded at the end of the level. Also awarded at the end of the level are stars. You can earn up to three stars for each level, these are equivalent to bronze, silver and gold awards you see in other games and are calculated on a combination of your score and fort health. 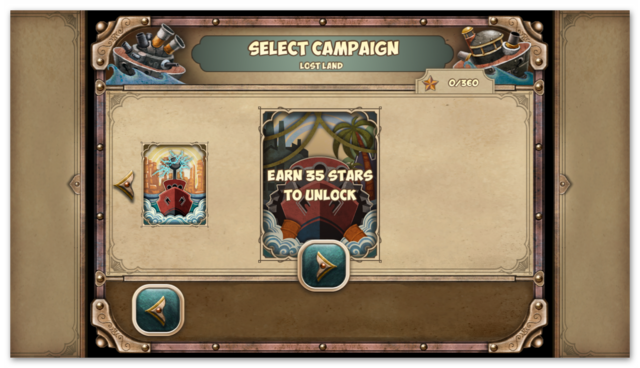 Starts are used to unlock a second campaign called Lost Land. Each campaign has 20 levels to beat. Next to the anchor symbol is your health indicator. 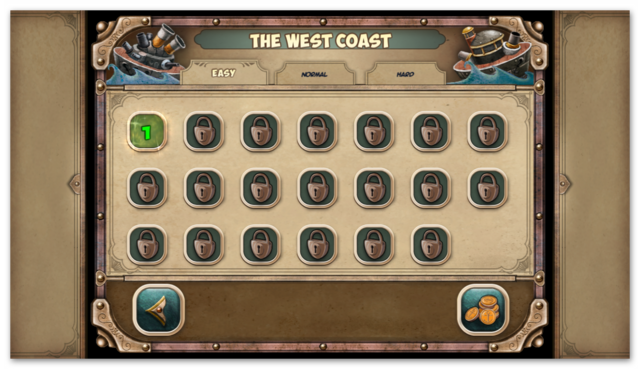 You start with 25, which as indicated above can be increased by spending your anchors on the fort upgrade. This indicates the health of your fort. 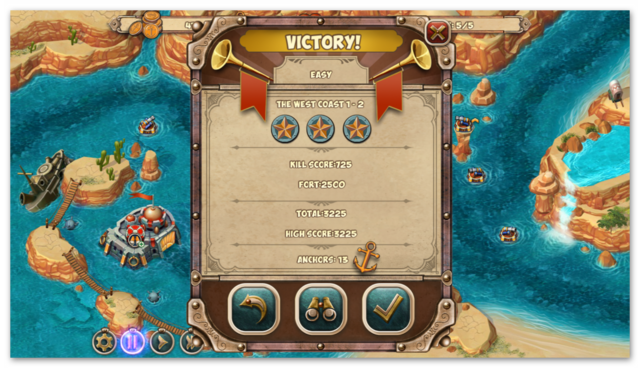 If any enemy ship manages to survive the gauntlet of your towers, and enter the fort, you lose one health for each enemy entering. Losing all 25 ends the level. Next to the fort health indicator is the wave indicator. This shows you how many waves to expect in the level and which wave is current. Along the bottom of the game arena are four buttons. 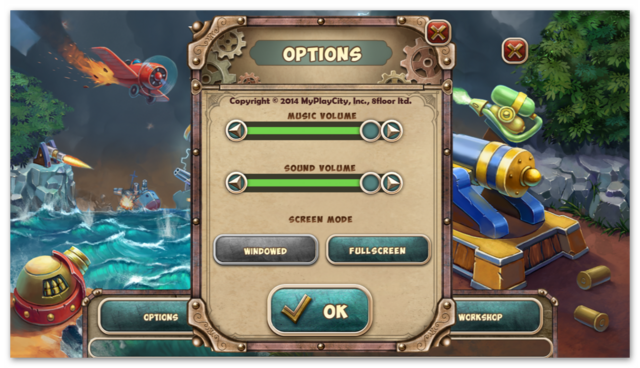 The first is your options button The second pauses the game and the third restarts the game. The fourth will increase the speed of the game. This is useful once you've completed your tower building to rush along the level. Finally, at the beginning of a new wave you are given a warning as to how long it will be before the next wave starts. This appears next to where the wave will start. This can change from level to level, so it's important that tower placement is done tactically so that you don't leave an entrance to the fort area poorly or totally undefended. You can force the wave to start immediately by clicking on the next wave button. This will earn you some extra gold. The sooner you click on the button when it appears, the more gold you earn. 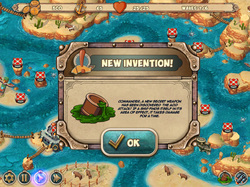 As you progress new inventions will appear, for example as soon as you start the game there are two inventions given. 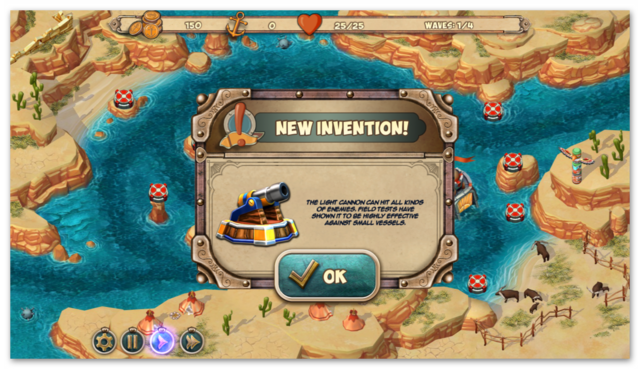 1) ...The light cannon (your basic tower defense weapon) . The light cannon can hit all kinds of enemies. Field tests have shown it to be highly effective against small vessels. 2) ... The armored launch - This is the enemies light motorized boat that is quick but is also weak and therefore is destroyed easily. Then, as you progress other inventions appear for example the heavy cannon, which is more powerful than the light cannon and has a longer range but fires more slowly. It is also limited to ground and low flying targets, and the airstrike which can be used once it has recharged. The air strike is particularly good at against ground targets and can destroy a large number of enemy ships if they are clustered together.. The air strike is particularity useful at the start of a new wave, but can also be used as an emergency tactic if it looks like some ships are about to attack your fort. You can cancel your airstrike by clicking on the airstrike button again. Inventions are not restricted to the defenders. Your enemies also get upgrades; for example their first invention is the corvette, a faster moving ship with more health. You get a warning located in the bottom left of the game arena when a new wave is about to start. When you hover over a tower defense, it shows you the area the tower can defend. Upgrading the tower using gold you've earned from destroying enemies will increase the radius of the defensible area. 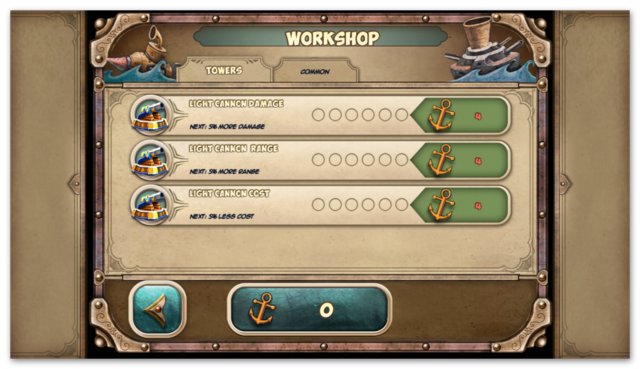 Once you have enough anchors you can upgrade towers further to increase their range even more as well as their destructible strength and reduce the cost. As you destroy enemies, you earn cash, which can be used to purchase more towers and upgrades. 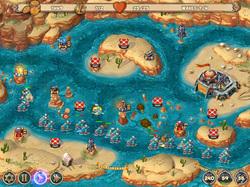 Placing towers in the correct positions, especially at the start of a level is crucial to survive. Some defensive areas are not as effective as others, so you need to select your first positions with care. There are two upgrades available for each tower, plus you can sell your tower for a limited amount of cash (only a percentage of what you paid for it) if the tower is badly placed, or you are in the end game and need towers nearer the fort to protect it from attack If your fort loses all of its health you lose. 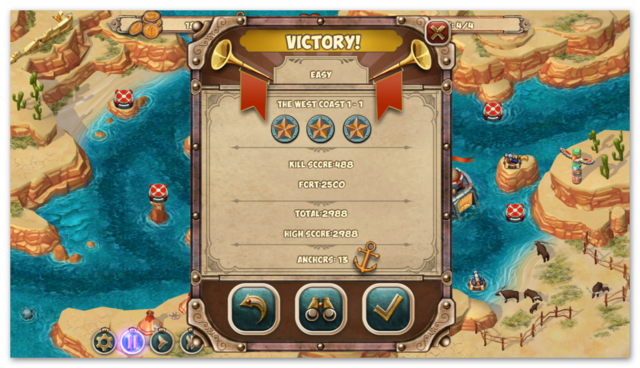 At the end of a level your level rewards will appear indicating how many stars you've earned, your kill score and points earned for defending your fort as well as the number of anchors you have earned. (I've not figured out how the game decides how many anchors you get yet). Along the bottom of the level stats are three buttons. The first one allows you to restart the level, the second one takes you to the level selection screen where you can opt to play the next level, or any previously unlocked level. The third button takes you to the workshop. 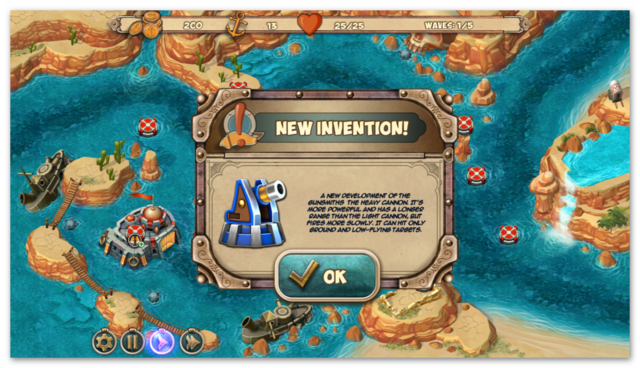 As new inventions are found they are added to the workshop and can be upgraded up to six times. Each upgrade costs more to buy for example the first upgrade costs four anchors, the second costs 10 anchors the third 14 anchors etc. Each upgrade reduces the percentage costs, or increases the percentage effectiveness of the upgrades. Another run of the mill Tower Defense game. I love the genre, but this is a formulaic off the factory line type of tower defense game. I've seen twenty or more of this type of Tower Defense game released over the last several years, each one virtually the same apart from the story and background graphic. It's playable, but not inspiring like some Tower Defense games I've played over the years. My favorite is still Defense Grid: The Awakening. The difference between that and today's offering is in my opinion immense, with little in the way of interesting level designs. Still Iron Defenders is playable and does give some excitement to the game. If you are relatively new to this genre, this is an excellent game and worth a decent 7 out of 10. From my own experience of playing many tower defense games I'd rate it a little lower at 5 out of 10, but that's just my biased opinion. You can see several in-game videos of game play HERE, HERE, HERE, HERE, HERE & HERE. If you're having problems installing or activating or getting Iron Sea Frontier Defenders to work please visit the FAQ's Thread HERE and read through the communities comments because sometimes fixes have already been posted, for example, a common issue seen since the Themida wrapper was introduced three years ago is that some community members installation of the game are blocked by their security because Themida code has been known to hide malware, (usually an error message is flagged for example 'The executable is corrupted' even though in reality it is not); so as a precaution some anti malware programs will block and even delete the suspect installation files even though the files (i.e. the setup, read me and setup.gcd files are actually totally free from malware. This issue can be solved either by rebooting your computer in safe mode with networking or a quicker method is to temporarily turn off your security software to allow the installation. You could also try white-listing the setup.gcd file. In the almost 12 years this game giveaway site has been operating there has 'never' been a game given away that was infected with malware. I'd like to take this opportunity to thank MyPlayCity for giving away Iron Sea Frontier Defenders and also to the game giveaway team, as always, for securing other ways to get free games. 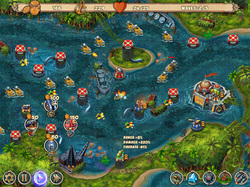 If Iron Sea Frontier Defenders doesn't doesn't interest you, but you still hanker for something new to play, you'll find details of some game deals whether they be sale items, heavily discounted (up to 95%) indie bundles or games being given away for free HERE (I've not updated the thread in a while, but most of the links still take you to the latest deals). The free game over at Epic Games is now The Witness; a single-player game in an open world with dozens of locations to explore and over 500 puzzles; (sells for £29.99/$39.99/€36.99/₽699). From the 18th of April Transistor (sells for £15.46/$19.99/€16.79/₽435) is available free HERE; a sci-fi-themed action RPG where you discover the world of transistors; from the creators of Bastion. Indie Gala have removed some of the games that were available last week and added new ones to their free games list, (at least 20 free games are available via their recently added showcase section) that includes adventure, RPG, Simulation, strategy and casual games (most recent first) i.e. Survivalist (a huge open-world Role Playing Game), Galactic Missile Defense - ( an endless/leaderboard-based shooter and tower defense game, where you must protect Earth from the invading Martians), Super Destronaut - (A retro space invaders clone), Siluman Project - (An RPG Maker game where the purpose of the game is to defeat monster girls bosses and reach the ending based on what action do you do), Five Nations - (A futuristic real-time strategy game that follows the events of a mind-bending opera of space about the survival of humanity), False ReBirth - (Another RPG Maker game - A psychological, story-focused game about the last remaining human), GOR - Gorilla Office Rampage - (Top down action game - play as a monkey and you smash stuff), Home is where Chip is - (Casual simulation), Age of Fear: The Free World - (introduction to the series' tried-and-true gameplay, focusing on non-linear exploration and combat in an Open World style), Die Legende von Saya: Befehl aus der Dunkelheit - (aka The Legend of Saya: Command from the Dark) - (Action adventure RPG), What Never Was, The Last Humans: Awakening, Childhood, Dunwell, Safe Not Safe, Hi Hotel, Bugs Must Die, Cuadradito y Circulito, Hellino, Hovership Havoc and Wake Up , or you can find them all HERE. Finally, there are some excellent bargains on sale via Steam HERE. Apex Legends (a free-to-play Battle Royale game where contenders from across the Frontier team up to battle for glory, fame, and fortune), Path of Exile (Action RPG with hack and slash elements and character customization), Star Trek Online (command your own starship and crew, explore strange new worlds, seek out new life and civilizations, and boldly go where no one has gone before), Paladins® (A free-to-play fantasy team-based shooter wielding guns and magic), ArchAge (a free-to-play fantasy-sandbox MMORPG), Warface: Blackout (a free-to-play MMO first person shooter from the creators of Far Cry and Crysis), Art of War: Red Tides (a multiplayer strategy game), Warframe (a cooperative free-to-play third person online action game set in an evolving sci-fi world), Star Conflict (Play as an elite pilot in an action-packed, massively multiplayer space simulation), Atlas Reactor (a turn based strategy shooter), Hard Light Vector (a first-person action platformer where you traverse an alien environment), 天际起源 The Ark of Horizon (a Battle Royale game. with multidimensional battlegrounds - sea, air and land), Auf Abwegen (on the wrong path) (a narrative driven mini-puzzle-platformer), ManaRocks (an online strategy card game), HYPERFIGHT Max Battle (a fighting game where every hit is lethal, and every win counts), Magic Mouse (an action-adventure top-down dungeon crawl set in a fantasy world), Ultimate Logic Puzzle Collection (over 50 types of logic puzzles), Hades' Star (a unique space strategy game where thousands of players participate in one shared galaxy), Swarm Simulator: Evolution (a strategic, incremental, idle, clicker game), World War II: TCG (a collectible card game where you create your own Army Deck with Tanks, Infantry, Aircrafts, Ships, Submarines and Structures), Moe! Ninja Girls ( an anime visual novel game that contains the perfect blend of reality and out-of-the-ordinary), Rise of Legions (a hybrid of MOBA, tower defense and deck building. Play solo or bring a friend for co-op, collect cards, build your deck and crush your enemies), Marble Combat (a physics based multiplayer game for 2 - 8 people. Players compete as magical marbles racing and fighting to dominate capture points and collect power ups), Comet Crasher (soar, shoot and dodge - but don't stop moving. Fall down at breakneck speeds in this fast-paced platformer filled with chaos and explosions), Supraball (play football in first person view and develop your own tactics and tricks. Play with up to 9 of your friends or join alone), Idle Space Raider (you are one of the station guards and need to patrol space. Complete missions and raids, upgrade ship and station to increase your power), White Dove 白雀 ( a puzzle game with mild horror elements, Chinese language only), Breathe Peace World (visit a VR storybook world and learn how to relax), Becalm (fancy a relaxing drift through magical waters? Enjoy this seafaring voyage in search of the sunset), King Rabbit (a puzzle-platformer sandbox), Idle Wizard (RPG/Idle hybrid about becoming the most powerful wizard there is. Pick a class, get a pet, configure and improve your character in a miriad ways), Black Survival / 黑色幸存者 (a Real-Time Survival Game, where you must survive by any means out of 10 competitors in a deserted island), Fovos VR (a post-apocalyptic horror, rail shooter for the HTC Vive), Dimension Of Gameth (a turn-based RPG board-game), Its Simple, SHOOT (a minimalist top down 2D waveshooter), The Walsingham Files - Chapter 1 (an episodic mystery-adventure game series made with RPG Maker), Wasteland Survival (a survival game in a post apocalypse wasteland), Drunken Wrestlers 2 (a funny physics-based multiplayer fighting game with Steam Workshop support), BLOCKADE Classic (a first person shooter in an editable procedural cubic world), VTB Basketball League VR (play in VR as a basketball player in the VTB united league- Russian language only), Sin Slayers (an RPG with rogue-like elements set in a dark fantasy world), Exosphere (a climbing game where you shoot, jump & bounce your way into the outer layer of the atmosphere), Alice in Stardom (a 3 hour long visual novel about Alice entering a top idol competition) and finally Infinite Art Museum (a virtual reality museum and archive of art with a growing collection of over 500 original paintings, illustrations and photographs from artists around the world). I've never liked tower defense games, I'd rather play Risk clones. 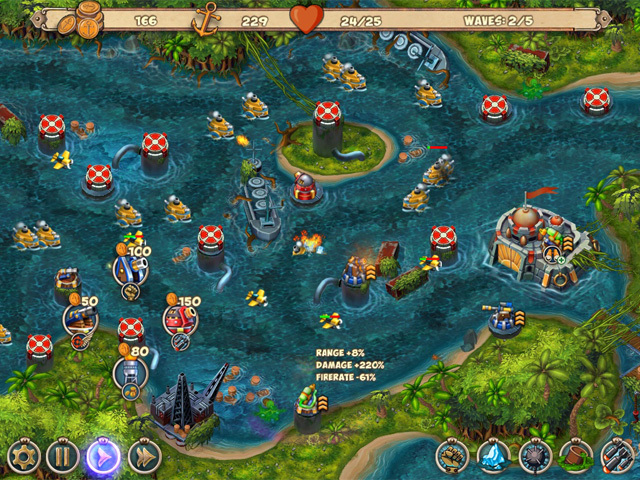 Iron Sea Frontier Defenders is a tower defence game by 8 floor games. If you’re not familiar with those – 8 floor has a huge amount of these tower defence games and they’re all variations of the same theme – they’re cookie-cutter games – which means if you’ve played one, you’ve played them all. However, they are well worth playing. You have two scenes and each scene has an Easy, Normal, Hard settings. You won’t pass on the Normal or Hard settings without having purchased some upgrades. You’ll have a much easier time of it if you first play the game through in Easy mode and buy the upgrades and then switch to Normal etc. They are challenging to get gold – it does require you to strategically place the right weapons in the right spots – and other times it just requires you to have bought enough upgrades so that your weapons are strong enough. What you upgrade is completely your choice and that also impacts on the game – and makes it fun & challenging. You’ll have flying and sea-faring objects. They have different speeds and strengths. There are objects that can hide other objects - (they become visible when they take damage (use a secret weapon on them) – or go past a certain tower. You can click the object you want destroyed first and all the weapons will target it – which allows you to play strategically. 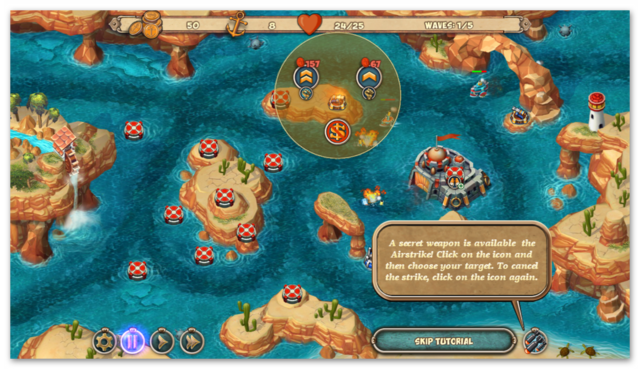 One of the nice features of these games is that you can pause the game at any stage – place or upgrade your weapons – and then continue the game. 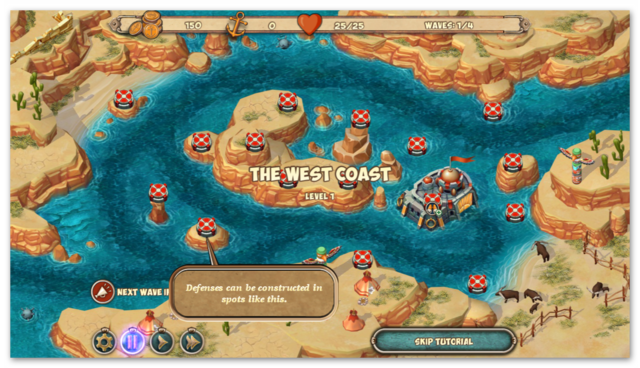 Iron Sea Frontier Defenders is a tower defence game by 8 floor games. If you’re not familiar with those – 8 floor has a huge amount of these tower defence games and they’re all variations of the same theme – they’re cookie-cutter games – which means if you’ve played one, you’ve played them all. However, they are well worth playing. You have two scenes and each scene has an Easy, Normal, Hard settings. You won’t pass on the Normal or Hard settings without having purchased some upgrades. You’ll have a much easier time of it if you first play the game through in Easy mode and buy the upgrades and then switch to Normal etc. They are challenging to get gold – it does require you to strategically place the right weapons in the right spots – and other times it just requires you to have bought enough upgrades so that your weapons are strong enough. What you upgrade is completely your choice and that also impacts on the game – and makes it fun & challenging. 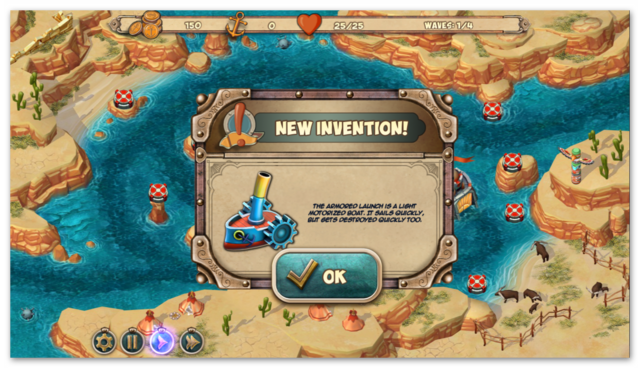 You’ll have flying and sea-faring objects. They have different speeds and strengths. There are objects that can hide other objects - (they become visible when they take damage (use a secret weapon on them) – or go past a certain tower. You can click the object you want destroyed first and all the weapons will target it – which allows you to play strategically. One of the nice features of these games is that you can pause the game at any stage – place or upgrade your weapons – and then continue the game. Thanks for the giveaway.